The kids are home for the holidays and baking is always a popular activity and this recipe is so easy the kids can definitely get in there and help. So with flour everywhere, the extra choc chips tasted and the spoons and beaters licked here is our result :) ENJOY ! Preheat the oven to 180 c. Place butter and sugar in a bowl and beat until light and creamy. Add vanilla and egg and stir to combine. Stir in the sifted flour, baking powder and salt until just combined. Fold through chocolate chips. Place spoonfuls of cookie mixture on a greased and lined baking tray, allowing room for spreading. Cook for 15-20 mintues, until they turn pale gold. 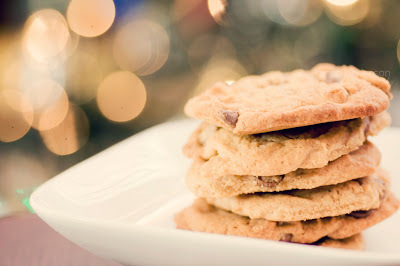 Allow to cool on the tray for 5 minutes before placing biscuits on a wire rack to cool further. Makes 16.